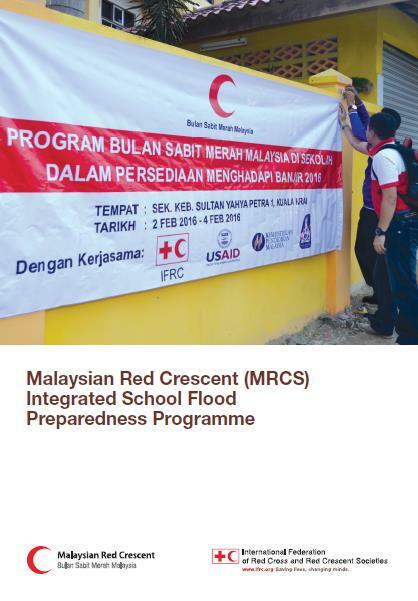 The brochure encapsulates the features and successes integrated school flood preparedness programme conducted by The Malaysia Red Crescent Society in 2015. The Malaysia Red Crescent Society Integrated School Flood Preparedness Programme was customized to use the Youth as Agent of Change (YABC) approach with key messages from Health, WASH and DRR from existing materials and manuals such as CBHFA, ECV, CHAST, YABC CBDRR and safe schools, focusing on the floods. As part of the MRCS East Coast Floods Recovery operations, an integrated approach in terms of software was developed to complement the hardware that was being implemented in the 5 adopted villages in Kelantan, the state that was affected the worst by the floods taking place between mid December 2014 until January 2015. The positive outcome of the programme thus far has inspired Kelantan branch to expand the programme and replicate the Teacher’s Workshops to cover Red Crescent teachers from all schools for the entire state, and the interest of National Headquarters to replicate this in the other east coast states; Pahang and Terengganu. Ministry of Education officials who were also present as guests at the teacher’s workshop and school implementations showed tremendous encouragement and interest for this programme to be expanded nationally.